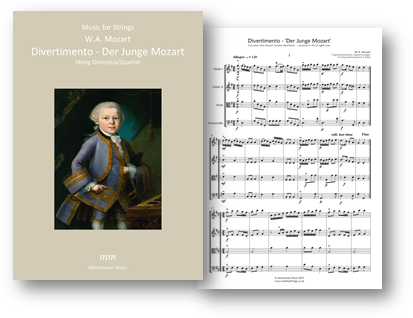 A selection of pieces from the young Mozart's 'London Sketchbook' (written during the composer's eighth year) arranged for string orchestra/quartet. Seven pieces have been drawn from the collection to form this five movement divertimento. The PDF contains parts for violin III, doubling that of the viola, and double bass. Click here to listen to a recording of the piece.